You’ll never guess what scientists call the moons of moons — well, you probably would. It’s submoons, but NewScientist’s Leah Carey has a better idea: moonmoons. 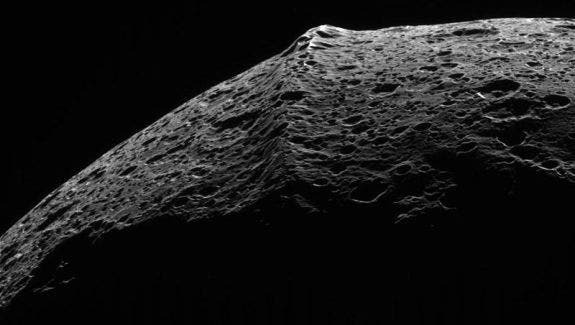 Saturn’s moon Iapetus might, in theory, have its own submoon. We know that moons orbit planets, planets orbit stars, stars orbit the center of the galaxy, and even galaxies sometimes orbit each other. But are moons also orbited by something, and if yes, then what do you call these objects? The problem with (ahem) ‘submoons’ is that we’ve never seen one. There doesn’t seem to be one in the solar system, or at least we haven’t seen it yet. But this, Kollmeier and Raymond argue, doesn’t mean that they don’t exist. The biggest problem with such objects would be the moon’s planet. Moons are much smaller than their host planets, and therefore they have a much much smaller gravitational pull. If the moon would be too close to the planet, it would risk losing its submoon to the planet’s tidal force; if it would be too far, it might simply not be able to hold its submoon, which could shoot off in space. So the conditions have to be just right, but they are possible, according to the researchers’ calculations. In theory, the Earth’s moon could have its own submoon, as could Saturn’s moons Titan and Iapetus and Jupiter’s moon Callisto. Except they don’t. So we might have to wait a bit before we can validate the theory. But if we do identify submoons, it would do much more than just fulfill a stellar curiosity — it could help us learn more about how these systems, and the host planets, form in the first place. Regarding the name for these hypothesized objects, researchers would like to stick to ‘submoons’ — but that doesn’t mean they don’t like the alternatives. Taking to Twitter, Kollmeier says she’s also happy with some alternatives, including moonmoon. So as far as I’m concerned, moonmoons are now a thing. I guess the only question now is can moonmoons have moonmoonmoons? The paper is published in arXiv.